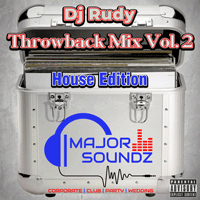 90 mins of the biggest club anthems that was released between 1995 and 2005 mixed by DJ Rudy. This mix features songs from the following Artists: Rodamaal Ft Nicinha, Kaskade, Soliders of Twilight, Faith Evans, Hot Toddy, M.A.N.D.Y. vs Booka Shade, Ladycop, Chicken Lips, Tiefschwarz, Daft Punk, Stardust, Soul Providers, Live Element, Paul Johnson, Brent Laurence, Sharon Phillips, Shakedown, Mylo, Demon, Alan Braxe and Fred Falke, Bob Sinclar, Salif Keita, Shena, Black Legend, Junior Jack, Deep Swing, Earth Wind and Fire, Richard "Humpty" Vission Ft Devon'e and More. Apologies for the audio quality on some tracks – the original 12 inch vinyl (LP) of every track was used in the recording of this mix.